Oh My Neck! - Cars! Cars! Cars! Thirdly, the Honda Fit's seats are apparently lightly upholstered marble benches. Seriously, I have never been in a car that gave me as much seat related discomfort. This brings up a good point about test drives: How can you tell if the seat is going to bother the hell out of you? We had tested a few Ford Focuseseses and knew immediately we could never buy the thing -- it hurt to drive. Oh, it handled well and the seats were decent, but the accelerator just didn't mesh with our leg and foot combo. Pain! When you go to test a car, you are usually limited to a certain amount of time and, while not expressly said, miles. So how can you test a car to see if it will really work for you? How can you tell if a seat is made of "upholstered marble" if you can't take it on a five hour trip yourself? Anyone have any tips to share? Oh we snagged that photo but good! It's from Thenys' group of snaps. We win! I'm only 5'11" and I was not comfortable in the fit at all. Its something with the side of the seat design its annoying and uncomfortable I felt like I was sitting in an awkward position the whole time. Nice blog by the way I like your style of telling it how it is. The Toyota Sienna does a pretty good seat. I haven't had any problems with it whatsoever. That's why I am a Toyota and Honda guy. Now my 10-year-old son on the other hand. He's developed a Flying Ford that you've got to see. Check out the video by clicking the link. It's worth the look. Honda seats need more padding and room unless you are a MIDGET weighing 50 LBS. or less. I posted on Edmonds as well as here. As an owner of a '08 Honda Fit with just over 10,000 kms. there is no issue with seat comfort. I driven for 4-12 hours with only the shortest of breaks like gas, food, etc, no seat issues at all. I THINK the Edmonds staff member has back issues as a rule, perhaps weight issues too. Just guessing, we cannot blame a car seat without knowing the physical condition of the person under consideration. All I do know is the seat is fine for me, I have no weight issues nor back conditions. To each their own. For some of us, it's easier than others. I'm 6'4", so the majority of cars are ruled out for lack of headroom, leg room, non-telescoping steering wheel, or some other ergonomic nightmare. Generally, I've found car seats to be pretty good...some better than others. The best car seats I ever had were in a 1979 Citroen CX. That was one comfortable long-range car (and one very UNcomfortable car to work on). The worst ones were on a '94 Grand Cherokee Limited - they looked nice, but were not at all supportive or accomodating. I think the best way to judge if a seat is going to work for you in the short time of a test drive is to compare to something you know already: your car(s). Figure out what you like and don't like about your current seat and try to make some quantitative measurements. Is there enough thigh support, and how much more/less would be better? 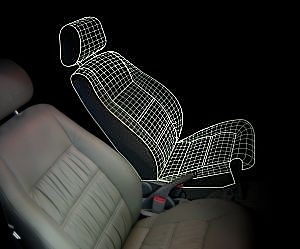 Can the headrests be adjusted to keep your neck from snapping, or are they just for looks? As for firmness, I generally look for something that feels pretty firm to begin with, since that often translates into support a few hours down the road. If a seat feels like my couch when I first get in, it's going to be miserable on a road trip. One other thing I look for is partly a build-quality issue: is the steering wheel actually centered in front of the driver's seat? That seems like a no-brainer, but I have tested several cars where that isn't always the case. My '96 Ford Explorer's wheel was offset to the left about an inch from center. That doesn't seem like much, but your back will let you know after a few hours. I recently test drove a BMW 6-series that was even more off-center. The sales klown said it was because of upgraded seats or something stupid like that, but that's absurd. The nice thing about checking these things is that you can do it without an actual test drive. Either you fit in the car or not, and you should be able to get a good, comfortable driving position before even starting the motor. I use the local auto shows to sit in a bunch of candidate cars without having to deal with sales people. It's easier to arrange a drive for the few on your short list than to go to a bunch of dealerships just to do the initial scouting.